The three main characters that we follow through Divided are Amina herself, support worker Zara (the first we hear the words of, in a nice but curiously underlit scene, of the arrival at the refuge), and finally the unnamed, Mother-in-law. All three characters are brought distinctly to life by Anwar-Khan, despite the decision to not have any costume or visual changes to the actor. Despite this lack of visual cue, you always know where you are as the story evocatively evolves. Via a few shows, especially with University of Northampton ones, I have had the chance to see a number of performances like this where one actor creates a number of personalities, and one thing that I have seen before is the use of a microphone for certain parts, be they another character, or often on verbatim accounts. Here, for me, it is slightly less successful, and also felt unneeded as we were only following such a small number of people. There were technical issues with it I realise, however, physically it did cause a few unnecessary moments as well and it was an addition for me, which took away more from the production than it gave. However, this is a tremendously informative piece, the kind of theatre that has to work hard, as issue plays often do get bogged down with information, and sometimes become preachy or overly worthy in the way they tackle the issue. This often is much to the detriment of making their point. Divided, however, and it's writer and performer, has a way of making the show both informative as well as often keeping a balance between making the play watchable as well. There are surprising amounts of humour at play, with clever sequences involving Amina learning English and the excellent interaction she has with her work colleague Malik. 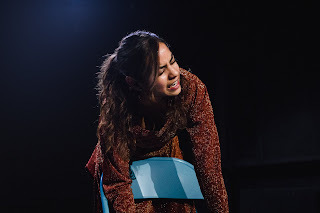 The latter scenes are some of the best of the play and offer a brilliant balance in emotional depth, with lovely touches of humour, ranging from her brilliant samosas, to cricket and indeed the music of Slade, creating the British world from the eyes of a relatively new person to the shores. As much as the lighthearted happens, this play does eventually divert to more challenging themes, as it must. 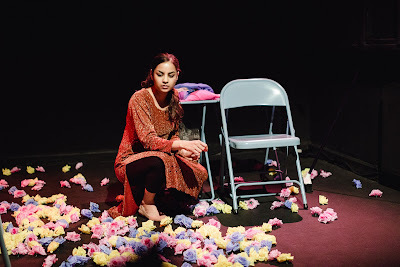 The scene where the sexual assault is explained is clearly the most powerful of the play, and despite only one actor on stage, it remains as strong a sequence, also including the fourth voice of husband Amir forcefully interjecting (also performed by Anwar-Khan, not pre-recorded). Staging wise, including the work of the director of Christopher Elmer-Gorry is compact as required for the small venue area, however, the movement is created brilliantly through a small number of chairs and vast numbers of scattered (paper) flowers. What I especially liked was the decision to play the performance as if the other characters were really there despite being silent. 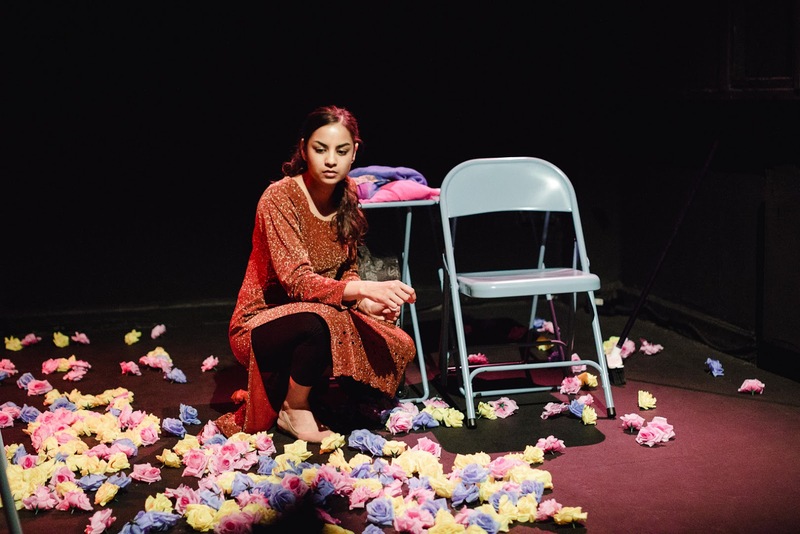 This created an interesting visual perspective often, with Anwar-Khan talking directly to the invisible person, rather than a play purely directed at the audience. The movement was even created to allow the other people space to move about. It was really neat and clever to observe. An extremely bold decision of the writer/actor was in performing some surprisingly long parts of dialogue in Urdu. It obviously is a danger to take what in all likelihood, would be a great deal of your audience out of the play, however, it was a fine balance that, for myself, just came down on the right side of an acceptable amount. If nothing else, it also cleverly highlighted how Amina might feel, which I feel certain is, of course, part of the point it is included at all. Divided bridges successfully the place between creating a play that is watchable and putting forward the important message it tells. It is clearly a piece that has been created with a huge amount of dedication by its writer and performer, as many solo shows of this ilk I have seen before do, including most recently This Evil Thing. These are the shows, that while they could live in the hands of another performer, they would perhaps lose that almost hidden sphere of dedication with someone who hasn't learnt the words through their very creation. It tackles, of course, a huge subject of sadness, but with a surprising lightness of touch that actually makes you learn and understand the theme just that little easier and clearer. An excellent piece of theatre, extremely well written and performed with an immense amount of dedication to it as well. Absorbing and powerful one-woman show. Performance reviewed: Saturday 2nd December 2017 at Dostiyo, Northampton. There was a Q&A after the performance that I saw and it was fascinating to hear from members of the audience that were directly involved with the areas touched on during Divided, and indeed the appreciation of how well the piece had been constructed and also performed. However, the most interesting part of the Q&A came when it was slightly derailed off theme by a question from the audience over funding for this, and shows like it. The discussion went a little political over money and where the, apparently dwindling funds, should truly go. We all know that there is an endless waste going on at the top levels of councils and governments, and the areas such as arts are the first to get chopped often (other than perhaps the elderly and various social care areas). However I suspect those at the top truly have little inkling of how important either themed shows like this, or just simply those that just entertain and bring communities together, truly have on the people that either take part or watch. I have seen over my theatre years a number of shows that were funded like this, and last Christmas I even took part in one. Seeing this from both sides has left me in no doubt that whether they were issue plays, as these funded ones often are, or set out to provide a tangible community spirit to those taking part or just watch, it is clear that they remain a vital part of the community and must be funded. The community ones, are potentially the first moment of contact for some young people with the world of the arts, and that in itself might open up a world beyond that will only enhance their lives for the better. Therefore, yes, money is tight, but like sport is vital for physical fitness, arts are vital for mental fitness, and perhaps are one of the last items to have funding removed from, not the first.